Marvel Easter eggs are often hints of there being some sort of grand design in place. We’ve had everything from Wakanda showing up in Iron Man 2 to an as-yet-unconfirmed Captain Marvel Easter egg in Avengers: Infinity War. But this is something else. 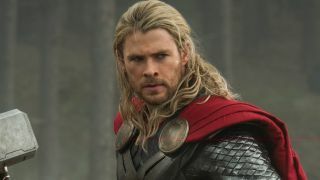 It all started in the original Thor way back in 2011 – and could very well have been giving us a sneak peek at the Soul Stone location, previously held up as the MCU’s biggest mystery. That’s seriously impressive. Thanks to Twitter user TheCriticalReviews (h/t SyFy Wire), a pattern has begun to emerge when looking at shots of outer space from Thor, Thor: Ragnarok, and eventually Avengers: Infinity War. Take a look. See that eclipse-style planet in each image? That, as Infinity War reveals, is Vormir, home to the Soul Stone (and, now, the Red Skull). So, in two movies prior there’s been the distinct possibility of Marvel literally showing us the Soul Stone location right in front of our very eyes. If true, that has required an exceptional amount of forward-planning. Of course, it could just be a case of some stock footage being re-used – SFX isn’t cheap, you know – and inserted in again and again. But that’s such a distinctive shot. I’m leaning towards Marvel knowing exactly what it was doing. It’s a studio with a long, long history of doing just that, after all and, for my money, could be the craftiest and most brilliant Marvel Easter egg of them all, especially knowing how important it ended up being. For the longest time, the missing Infinity Stone was the subject of an internet-wide investigation. Each MCU movie came and went, but the Soul Stone was never found. It eventually turned up in Infinity War, with Thanos sacrificing his adoptive daughter, Gamora, (*sniff*… I’m still not over it) to claim the Soul Stone as his own. Maybe he should’ve watched Thor and Thor: Ragnarok, first. It would’ve saved him a few years.